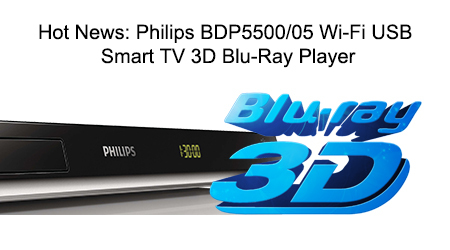 Be amazed by the new dimension 3D Blu-ray brings to your movie experience at home. Enjoy the best of Internet on your TV with Smart TV Plus, hassle-free with the speedy built-in WiFi-n. And play back more than ever before with DivX Plus HD. SimplyShare to connect and stream all entertainment wirelesslyPhilips SimplyShare lets you share your music, movies and photos from your tablet, smartphone and PCs to your home theatre and Blu-ray player. You can stream all entertainment directly from your DLNA-enabled devices or use remote control to access and stream media files from your PC. For the best wireless experience, install the SimplyShare app on your tablet/smartphone. You are now ready to enjoy all your entertainment effortlessly. Blu-ray 3D Disc playback for a full HD 3D experience at homeFull HD 3D provides the illusion of depth for a heightened, realistic cinema viewing experience at home. Separate images for the left and right eyes are recorded in 1920 x 1080 full HD quality and alternately played on screen at a high speed. By watching these images through special glasses that are timed to open and close the left and right lenses in synchronisation with the alternating images, the full-HD 3D viewing experience is created. Dolby TrueHD and DTS-HD MA for HD 7.1 surround soundDTS-HD Master Audio and Dolby TrueHD deliver 7.1 channels of the finest sound from your Blu-ray Discs. Audio reproduced is virtually indistinguishable from the studio master, so you hear what the creators intended for you to hear. DTS-HD Master Audio and Dolby TrueHD complete your high definition entertainment experience. Smart TV Plus to enjoy online services and multimedia on TVPhilips home theatre and Blu-ray player with Smart TV Plus offer you an array of enhanced features, including Net TV, SimplyShare and MyRemote. Net TV brings a wide range of online information and entertainment to your TV for services like video-on-demand. With SimplyShare, you can access photos, music and movies stored on your PC from the comfort of your couch. You can also use your smartphone/tablet to control your home theatre via Philips MyRemote app. Instant 2D to 3D conversion for a lifelike movie experienceEnjoy 3D movie excitement in your home using your existing 2D movie collection. Instant 3D conversion uses the latest digital technology to analyse 2D video content to distinguish between foreground and background objects. This detail generates a depth map that converts normal 2D video formats into exciting 3D. Along with your compatible 3D TV, you are now ready to experience full HD 3D. Built-in Wi-Fi-n for faster, wider wireless performanceWi-Fi-n, also known as IEEE 802.11n, is the new wireless network standard. It includes many new options to improve the quality of the wireless link, offering faster speed and wider range compared to previous Wi-Fi standards. Wi-Fi-n also features backwards compatibility, which makes it possible for this player to transmit to and receive from routers that operate on older Wi-Fi standards. USB keyboard connectivity for easy Smart TV and Web BrowsingInternet browsing is now more convenient. Without having to turn on your PC/MAC, you can surf all you want — in the living room, on your widescreen TV. Simply insert your wireless keyboard dongle or wired keyboard’s USB plug into your player’s USB port, and you can use a Qwerty keyboard to travel the information highway. Smart TV browsing is also made easier, since a remote control only allows words to be keyed in using its nine alphanumeric keys. There is now no need to carry a laptop around or squint at your mobile device’s small screen to enjoy Internet content. The Universal Serial Bus or USB is an industry standard that allows high-speed, easy connection of peripherals to PCs, consumer electronics and mobile products. The USB 2.0 provides better and faster performance – up to 40 times quicker than the USB 1.0 and with a data transfer rate of up to 480 Mbps from the original 12 Mbps. When plugged in, everything configures automatically. With USB 2.0, simply plug in your USB portable devices or hard disk drives, select the movie, music or photo and play away.